It's another day of introductions at Uniko. Today we have 2 stencils here. 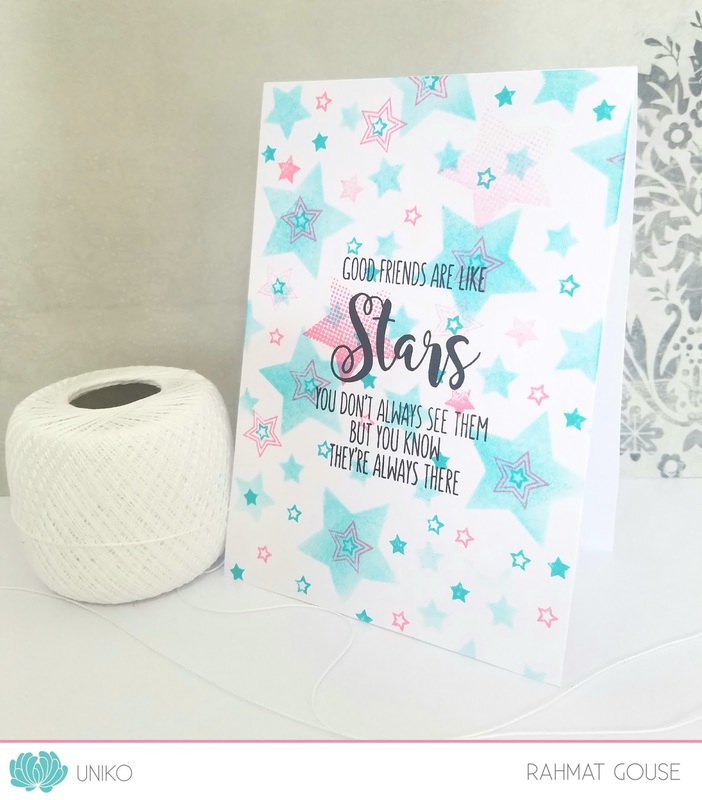 I have used this stars stencil with the previously released starry theme sets to add some stamping, and sentiments too. I have used Uniko colors here, if you pay attention to the packaging or my watermark, you will know what I mean. Sneak Peeks 20th - 22nd February, these little teasers give you hints at what is in store! Introducing 23rd - 27th, here you will see a closer look at the products being released with a daily blog hop with the Uniko DT. Oh that's just inspired! The colours obviously work brilliantly together and look sensational with the mix of stencils and stamps. Definitely is a gorgeous combination of the stencil and stamps. Love the colors you've used too - what a beautiful match! Wonderful card, Rahmat! Very pretty cad and great sentiment. Love this color combo of stars. Pretty colors on this beautiful card! Its wonderful card and a lovely colour combo ! Cool idea to combine the new stencil and the fitting older stamps with the Uniko-colours! Soft background for a great sentiment! So gorgeous, love how you featured these beautiful products!!!! Love the soft colours combined with the soft edges of the sponging - excellent sentiment to go with the theme too!